When it comes to cheap campervan hire Sydney, then there are lots of options! Travelwheels campervan hire in Sydney are specialists in good value for money campervan hire! Call our team on 0412766616 and we speak English, Deutsch and Français! We beat all competitor quotes for sydney to sydney campervan hire! Travelwheels campervan Hire Australia is based in Sydney. This means we can offer our lowest prices for cheap campervan hire Sydney deals for you! Have a look at this travelwheels campervans YouTube video of our most popular cheap campervan we hire. This is the best option for anybody wanting cheap campervan hire Sydney specials in a comfortable campervan! Renting a campervan in Sydney can be a great start for your Aussie adventure and is the perfect option to explore Australia on your own pace. If you never hired a campervan before and are not sure if this is your way of making holidays why don’t you try it and rent a campervan for a short round trip in and around Sydney? Sydney and its surroundings have a lot to offer for its visitors! You could visit Penrith with your campervan hire Sydney on your way to the Blue Mountains. With a quarter of a million hectares of native bushland you can get a great feeling for the country side of Australia. Penrith Valley is the location of the world renowned Sydney International Regatta Centre – with picnic and barbeque facilities, rowing, canoeing, dragon boats, club fishing, and sailing. If you want to hire a cheap campervan in Sydney come over to our shop in 191-195 William Street, Darlinghurst and we can not only give you a very cheap campervan deal but also provide you with great ideas for your campervan holiday in Australia. If you are looking for Cheap campervan hire Sydney, then just enter your details below. 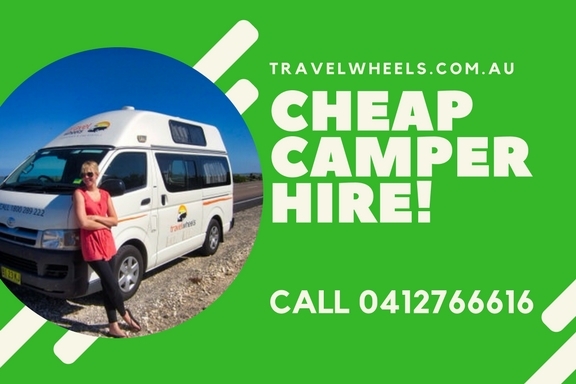 The travelwhels campervan hire sydney price checker will give you our lowest price for cheap campervan hire Sydney deals! We will not be beaten on Sydney to Sydney cheap campervan hire quotes. If you can find a better deal for cheap campervan hire sydney then simply call us on 0412766616 to price match!